The ALTA Cold Air Intake system pulls cold air from the ram-air duct in the grille in addition to pulling it through the vent below the windshield. The air-box seals to the hood and prevents under hood heat from entering the intake airstream. This keeps the filter surrounded by a fresh air bath. Thus reducing inlet air temperatures creating a cooler, denser air charge raising HP, and torque. Read more below to learn more! The ALTA Cold Air Box is formed from laser cut aluminum sheet metal then CNC bent to perfection. Then finished in a rich black texture powercoating for long term protection and an O.E.M. look. Our airbox seals to the underside of the hood preventing under hood heat from entering the intake airstream. 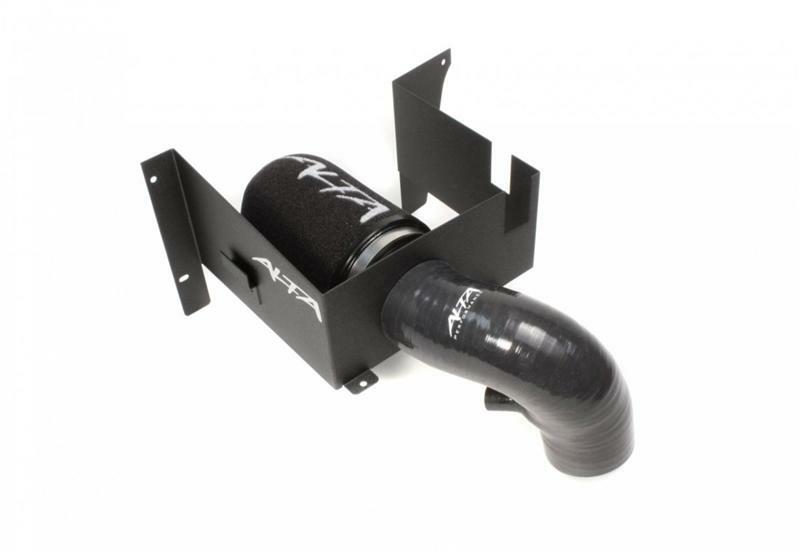 With an ALTA intake system your car will make a throaty, deep tone on throttle that is undeniably modified. You will be able to hear your supercharger whining. Even the stock one. The ALTA silicone inlet hose, connects the air box to the throttle body. With a mirror smooth finish inside and out, the silicone hose promotes increased air velocity traveling to the engine. Unlike the corrugated and ribbed factory inlet hose, turbulence is eliminated additionally the ALTA inlet hose has a larger inside diameter to support the needs of your supercharger at all boost levels. The ALTA Five-Ply Silicone Elbow included with our intake, is rated for 200psi, and 400 degrees. Like other ALTA products this part is over built to ensure a lifetime of trouble free use. This is one of the key features to our intake as the bend provides the proper MAF (Mass Air Flow) sensor reading and ensures no Check Engine Lights. ALTA is the only producer of a Cold Air intake system that truly provides a steady supply of cool fresh air! Thanks to our uniquely designed air-box, and smooth black silicone inlet hose, the ALTA Cold Air Intake has proven a 10-12 WHP gain many many times over.